Land based eLoran provides critical position and timing information when GPS/GNSS satellite signals are jammed or spoofed. Nautel has received a significant order for an enhanced Loran transmitter from UrsaNav of North Billerica, MA. UrsaNav will provide Nautel eLoran transmitter technology together with UrsaNav’s timing and control system, to the Korea Research Institute of Ships and Oceans Engineering (KRISO). Their contract to supply an eLoran Transmitter Test Bed System in the Republic of Korea represents the first phase in a larger program to upgrade Korea’s Loran-C stations to be the foundation of a sovereign Enhanced Loran (eLoran) Positioning, Navigation, and Timing (PNT) service. Many critical infrastructure sectors including maritime, aviation, electrical distribution, telecommunications, finance/banking, and digital broadcasting rely on accurate time and position data. The Nautel/UrsaNav solution provides an alternative to space-based navigation and timing signals, such as those used for GPS which are easily jammed or “spoofed” to provide inaccurate information. Instead of low power satellite signals, eLoran uses high power radio waves from land-based transmitters to send positioning and timing information to receivers on ships, aircraft, vehicles, and critical infrastructure. eLoran’s service is complementary to satellite services, such as GPS, and helps ensure continuity of operations. The KRISO Test Bed System uses the NL40, one of Nautel’s NL Series of navigational transmitters. 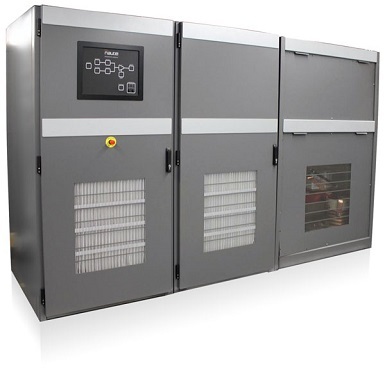 NL Series transmitters are capable of eLORAN operation in power levels up to one megawatt. “Future-proofing” for the next generation of LF signals, waveforms and modulation techniques is built-in along with exceptional pulse stability and enhanced control. Having unmatched levels of efficiency and redundancy, and a small footprint, the NL40 is the most sophisticated, fully solid-state, eLORAN transmitter available. With five decades of innovation in transmission technologies, Nautel is a leading manufacturer of broadcast transmitters, sonar amplifiers, and navigational beacons. Three ISO-certified manufacturing facilities in North America provide comprehensive design, fabrication, assembly and testing. With over 16,000 transmitters deployed in over 177 countries since 1969, Nautel continues to lead the way in providing valuable new solutions for navigation and broadcast applications. See www.nautelnav.com. UrsaNav, of North Billerica, MA, provides the world’s most advanced solutions for Low Frequency Alternative Positioning, Navigation, Timing, and Data, including high-performance eLoran Receiver, Command and Control, and Differential Loran technology. UrsaNav’s staff have been involved in every major development in Loran and eLoran since the early 1970’s and have provided the technology and expertise for service provider installations in North America, Europe, Asia, and the Middle East. UrsaNav’s “sky-free” PNT technology is fully interoperable with, yet completely independent of, GPS/GNSS. Please visit www.ursanav.com. eLoran is the latest in the longstanding series of low-frequency (LF), LOng-RAnge Navigation (LORAN) systems. It meets the accuracy, availability, integrity, and continuity performance requirements for maritime harbor entrance and approach maneuvers, aviation En-Route and Non-Precision Approaches, land-mobile vehicle navigation, and location-based services. It provides bearing (azimuth) information, even when the user is not moving, and has built-in integrity. Users within the coverage area can simultaneously synchronize their timing to absolute (not relative) UTC. Of equal importance is that the eLoran signal includes one or more Loran Data Channels that are available to provide one-way, low data rate, “Short Message Service” information. eLoran is completely independent of satellite navigation systems such as the popular GPS system used by consumers. It operates in the internationally protected 90 to 110 kHz spectrum, is built on internationally standardized Loran-C, and provides a high-power Positioning, Navigation, and Timing (PNT) service for use by all timing and navigation users. SAE International expects to release eLoran standards this year. The RTCM also has maritime-related eLoran standards underway. eLoran is a key vertex of a Resilience Triad™ that would typically include space-based, terrestrial, and at least one other PNT source. 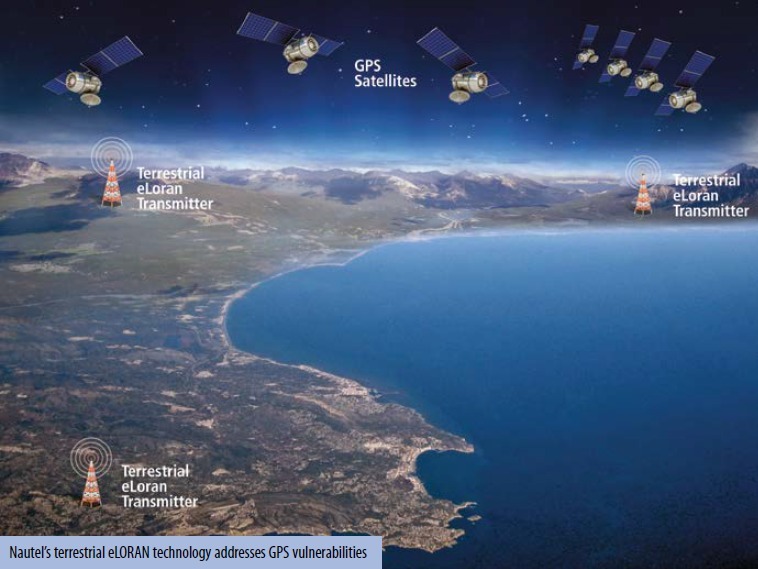 It is a very-wide area (i.e., country-wide or “continental”) source of PNT that continues providing a resilient solution even when a Global Navigation Satellite System (GNSS) such as GPS may be unavailable or untrustworthy. eLoran delivers information comparable to that of GNSS, but with completely different methodology. It is a very high-power, low frequency, pulsed transmission, whereas GNSS are low-power, UHF, multiple modulation scheme transmissions. eLoran is literally at the other end of the spectrum from GNSS, and has completely dissimilar failure modes. This means that an issue that disrupts GNSS is unlikely to disrupt eLoran. The unique characteristics of eLoran enable its use in environments where GNSS does not work very well, or at all (e.g., indoors, underwater, underground, and in mountain or urban canyons).